T.M. hasn't connected with their friends on Goodreads, yet. One of her favorite things about writing is how a single image or idea can blossom into an entire series. 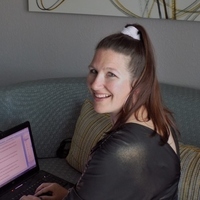 In her spare time, (what is th T. M. Becker, called Steph by her friends and family, is the author of the young adult fantasy, Full Moon Rising. Always a fan of second breakfasts, hobbits, and Grimm’s fairytales, she spent her childhood afternoons buried in a book or acting out scenes from her imagination in the woods beside her house. In high school, she discovered a passion for theatre and even began a recording of The Hobbit for her younger siblings, complete with different voices for each character. To ask T.M. Becker questions, please sign up. We’d love your help. Let us know what’s wrong with this preview of Full Moon Rising by T.M. Becker. "I enjoyed this very much. I like fantasy and it was easy to read. I recommend T.M. Becker for this series. I hope it turns into a t.v. series." "Amazing book!!!!!!!! Couldn't put it down!! I would highly recommend it!!!!!!" We’d love your help. Let us know what’s wrong with this preview of Draigon Weather by Paige L. Christie.